20th March marked the official launch of this exciting and innovative new collaboration. The school is a partnership between Oxford Health NHS Foundation Trust, Oxford Brookes University and Oxford University Hospitals NHS Foundation Trust under the umbrella of the Oxford Academic Health Science Centre (AHSC). First announced in March this year the school will uniquely combine education, clinical practice and research across the nursing, midwifery and allied health professions. With a focus on increased collaborative working and sharing best practice, the school has been developed to better meet the challenges of a significant period of change in nursing and midwifery education. Similar models have been successful in the USA with University of Pennsylvania and John Hopkins University ranked globally as the top two nursing schools. 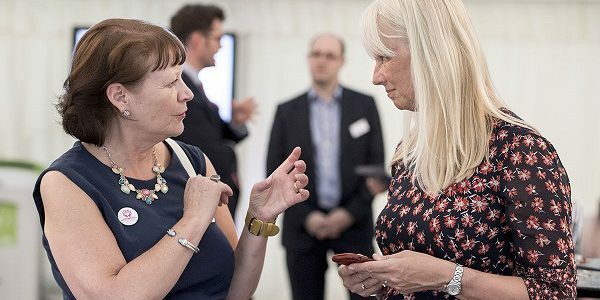 Ros Alstead OBE (pictured, on right), Director of Nursing and Clinical Standards at Oxford said: “We hope to attract the best graduates to Oxford, and encourage more local people into choosing nursing as a career.